There were Afghans in the Deccan at an early period, and there was a Lodi Afghan noble in the service of ruler of Bijapur as early as 1492-1493 AD. Adil Shah Yusuf, the founder of the dynasty which ruled over the Bijapur Kingdom , was the son of Usmanli Sultan, Murad, who died in 1450 AD ; and when orders were issued that only one prince of his family should be allowed to live , was exchanged for a young slave boy, who put to death instead for him. His chief Amirs were Turks and his forces were composed of Turks, Afghans, Arabs, Kurds, Uzbeks and other foreigners, beside Rajputs and other war-like natives of India. 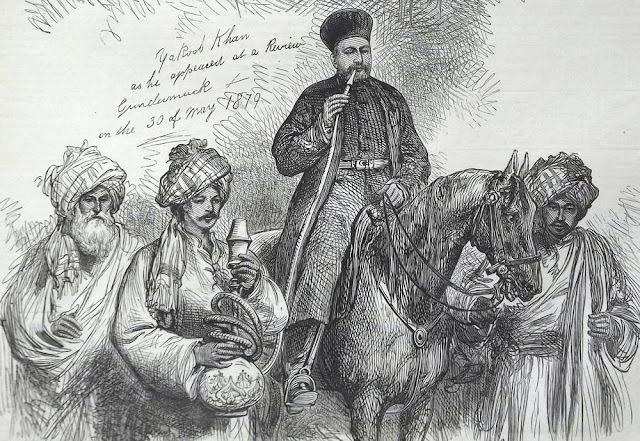 Some, however, say that Yusuf was a Circassian ; and others , that he was a Georgian , and that he was sold as slave to Sultan Mahmud Bahmani by the merchant alluded to above. When Sher Shah Sur overcame Humayun and assumed the sovereignty of Delhi , among other independent rulers was Sikander Khan from Afghan tribe of Miyana, who held the territories of Satwans and Hadiyah ; and he refused to submit to Sher Shah. who moved against him in 1542-43 AD, when he presented himself , but he was imprisoned. In after time he became he became one of the great nobles of Islam Shah, Sher Shah's son. On his being imprisoned, his brother Nasir Khan Miyana endeavored to seize Shujaat Khan Sur , Sher Shah's governor of Malwa , as a hostage for his brother;s safety, but he was defeated in the attempt. In 1543-44 AD, Alim Khan Miyana, broke out at Mirathh in the Doaba, but he was surprised by the forces of the governor of Sirhind, defeated and killed. It was probably about this time that the Miyana Afghans began to seek their fortunes in southern India. There were also Afghans of the Karlanri tribe of Dilazak in these parts. A Purdil Khan Dilazak, called by the nickname of Chibi-Tani, because he had always forty trusty followers at his back , was governor of the provinceof Sara in the Deccan,and there were other Dilazaks besides . The Miyanas in the times of Jehangir , appear to have been mostly settled in the kingdom of Bijapur. They were among the great nobles and feudatories of the Adil Shahi Sultans of Bijapur. They were the descendants of Jan-Nisar, a Shal Miyana, who held the personal rank of 2,000 horse in the reign of Ismael Adil Shah who ruled from 1510 to 1535 AD. He , Jan-Nisar Khan Miyana, was gigantic in size and was known by name of the Kala Pahar , or the dark or towering mountain, by the people of Deccan. Kala Pahar is the Hindi name of range of Mihtar Suileman or Koh-i-Siyah from which the family had come. Jan-Nisar Khan was killed in battle during war between Ibrahim , the Adil Shah Sultan, and Sultan Hussain, the Nizam-ul-Mulk of Ahmadnagar. He left behind two capable sons , of whom Aziz Mian, the eldest , received the title of Fath Lashkar Khan ,and the rank and position of his father ; and the youngest son, Abdul-ul-Nabi, entitled Ranmast Khan , held at that time the personal rank of 1,000 horse , and commanded a contingent of 700 horse. When, towards the close of the reign of the second Ali Adil Shah , who reigned from 1660-1672, his affairs on account of his vain-glory and self-conceit, fell into great disorder, most of his nobles became disgusted and disaffected, and several of them went over to the Prince Aurangzeb, then in the Deccan as the viceroy of the southern province of Mughal Empire recently acquired. Among them was Bahlul Khan Miyana, and on presenting an offering of three lakh of Rupees and valuable presents to the Prince. It was at this time, through Bahlul Khan's intervention , that Khizr Khan Barozai Panni obtained the fief of the sarkar of Karnool. Bahlul Khan died in the reign of Sikander Adil Shah.